10 minutes outside Birmingham, far from the Footlockers, JD’s and Size? 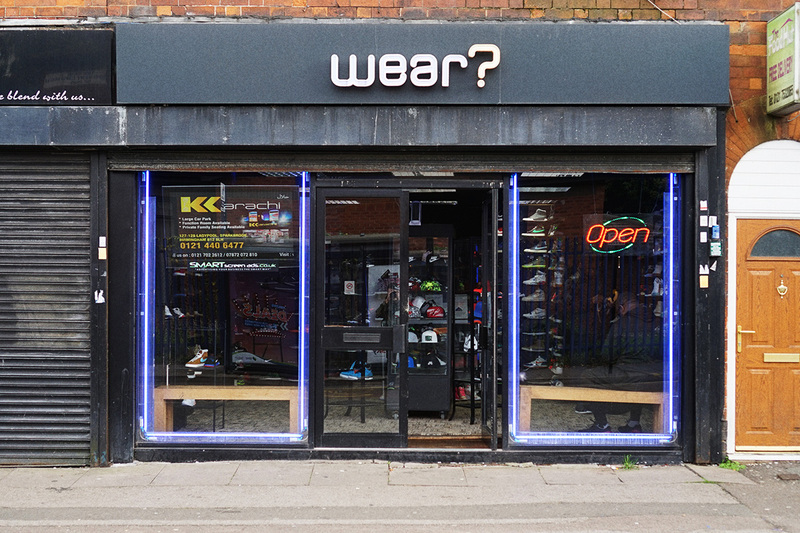 Birmingham’s only independent sneaker store resides. Swap the shiny discs of Selfridges for the free Palestine murals of Small Heath; tucked away on a side street off the diverse high street you will find Wear? We caught up with owner & OG sneakerhead Joseph. Let’s start at the beginning. Kicks, sneakers, trainers call them what you like. How did it all start for you? I got into sneakers back in ’93 when I use to travel to New York. Even though I had always been into sneakers, I couldn’t really afford my passion until around ’91-’92. Sneaker culture of then and now is worlds apart, how do you rate the scene today? Today’s sneaker head can generally consist of every walk of life. Where in my day it was more connected to street culture, football and music. There were very limited releases in those days (early 80s) whereas, releases now are every week. The scene these days is no longer about style but more about fashion. What’s the story with the shop? The shop was opened in 2012. I just really wanted to make my mark in UK sneaker history to be honest. Up and down the UK there may have been 3-5 independent sneaker stores; most were in London. I wanted to put Birmingham on the map as well as cementing myself in UK sneaker scene. I have been selling sneakers since 93 so I could have opened a store much sooner but the scene was not truly established until about 2011 to be honest. Adidas are much more cooler that Nike with regards to casual dressing. But Nike rules all round no doubt. In the 80s Nike had nothing over Adidas but from ’87 (Air Max 1) they started giving Adidas a beating, but from 95 (110s), Nike took the lead with no doubt. To be honest, if Adidas could put an air bubble in their sneaker they would have done so back in 87. There have been some iconic silhouettes released over the past 3 decades from the Air Max 95, to the Jordan 1, what’s your preferred silhouette? For me the Nike Air Max 95 and 97, the shape of both these two were revolutionary and the utilization of the air bubble was too innovative. The pattern on both took the whole Nike sneaker to another level. As an example, the swoosh became tiny, unlike all the previous Air Max releases. This made the air bubble the focus of the sneaker itself. The OG 95 (neon) & 97 (silver bullet) being my favorite colour ways. Give us a breakdown of your top five sneakers.